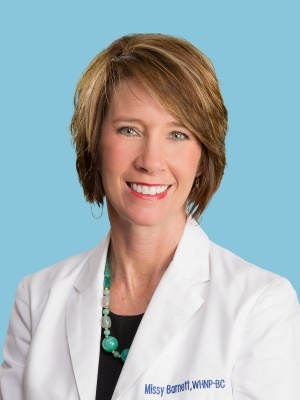 Melissa L. "Missy" Barnett began her career as a Board Certified Women's Health Nurse Practitioner in 1997 after receiving her Master's of Science in Nursing from the University of Alabama at Birmingham. Prior to returning to school, she worked as a Labor and Delivery nurse at NMMC Women's Hospital from 1992 - 1997. She received her Bachelor of Science in Nursing from the University of North Alabama. She is married to Steve Barnett, formerly of Iuka, MS and they currently reside in Booneville with their twin sons, Avery and Alex.